Victoire Gobin-Daudé, a self-taught perfumer, launched her line of 5 perfumes in 2002. Sous Le Buis is described as "Under The Boxtree - Tamed nature, boxtree freshly trimmed, softness of bark, sun heated stones. Hesperedic green: galbanum, lavender, sage, clary, orange flower." Sous Le Buis starts with a sharp, bitter green, very much like the smell of crushed leaves and stems and sap. As it dries down, the lavender intensifies along with the herbal notes. I usually find lavender in fragrance to be too harsh, but here it is very soft and smooth. There is a bit of orange blossom, and some light woody undertones. It is a dry green fragrance, and while it is not dark exactly, it has none of the bright freshness of many green scents, like Miller et Bertaux no. 3 or the newer version of Vent Vert. The green here is deeper, and in keeping with the ad copy, the feel is rather like being buried in shrubbery. I adore it, but it probably won't suit you unless you really love green. It is a unisex fragrance; many of the reviews I have read find it to be closer to masculine. Sous Le Buis is an Eau de Toilette, and the lasting power is reasonable. I confess that I have no idea what is going on with the Gobin Daudé line. It has been rumored for some time that she has two new fragrances in the works, but in the meantime, the line has just about disappeared from the US. Fortnum's in London had the line on markdown recently, but I don't know if they still have any in stock. Brown's (update: no more!) still has the entire line available online, at full price. When the line was still available in the US, a 50 ml bottle ran $140. As much as I admire the perfumes, I balked at the price. In the end I got my bottle of Sous Le Buis at Takashimaya for $19, and I doubt such a bargain will ever come my way again. Does Tak still have any GDs? I'd never pay $140, but at $19, the one I call Bitchin' Absinthe would be cool. Actually, I am still surprised at how much Tak marks down lines they are clearing out. Their sale table is sometimes amazing. So you never know, perhaps I'll get lucky again…a Different Company estagnon for $25? Ha ha ha…. They are long gone. I was told that mine was the last bottle in stock. It might be worth checking with Fortnums, I understand they were marked down substantially there. Might also be worth keeping an eye on Browns to see if they eventually put them on sale too. That is indeed an amazing deal. My oh my, I would snap it up for that price, too. Such a shame though about the line's rumored troubles with distribution, I'd suspect the GDs will become almost impossible to find unless the company makes it easier for retailers to get stocked. I don't see any GDs at Fornum, sadly, so I think that ship has sailed. It is silly, but I would have snapped up the whole line at that price, even the ones I don't really like. I can't resist a bargain. Ah, sorry N, I misunderstood what you meant by “interesting to say the least”. Glad to hear Printemps has them. Would hate to see this line disappear. I don't know where all the rumors about their distribution problems started, but the fact that it has literally disappeared from every store in this country certainly encourages the rumor mill. Thanks N, I don't know the store at all. N, I sent them an email question about 3 months ago, and they have never answered me either. I ve never smelled something that smells so natural! I don 't like green scents but if I did this would be it along with Seve Exquise. If I was to take on a 3rd bottle myself, it would be Nuit au Desert, but unfortunately I don't even have a sample at the moment so can't review it. A few months ago, I had that rare but wonderful experience of falling deeply in love with a fragrance during a marathon perfume-trawl. And it was Sous Le Buis. I wasn't so enamoured of the others in the line, but recently I ordered samples of all her range, and discovered that I like several of them, when I had the chance to properly wear them. Oddly, Biche dans l'Absinthe, which I loathed in the shop, I really like now I have time to develop it on my skin. I also like Jardins Ottomans, but wasn't so keen on Nuit au Desert. Seve Exquise is lovely and beautifully green, but so close to SlB that it seems pointless to have both,and of the two I prefer SlB. But there are none of them I'd turn down! Sous le Buis seems a prefect autumn scent to me – it has a damp, green, mouldy (in the most attractive way!) edge to it that seems to conjure up misty mornings and fine drizzle. It is truly evocative and beautiful. I find the packaging a little unimpressive for such an expensive scent. Heck no, I find it VERY unimpressive! It's always such a pleasure to come home at night and read your blog! Thanks for your info and insight. You mentioned last week that you may be doing a review of Flowerbomb. I'm anxious to read it. I bought it over the weekend, unsniffed. Not totally disappointed, but definitely surprised. Wanted more floral (my family for summer), but alas, the floral accord (to my uneducated nose) seemed to be light and fleeting, the patcholi base remniscent of Prada. More like Prada for warm weather. Thankfully, I love Prada. Guess I'll be liberally layering it with one of my stronger florals. Did that today with SL A la Nuit, and got the fragrance that I thought Flowerbomb would be. Thank you so much Cindy! Will probably get to Flowerbomb next week. Completely agree that it is not what you would expect from the name. Don't like patchouli much, and Prada is not a huge favorite, so you can probably already get the drift of my feelings on the fragrance. Nice review of one of my favorite (at the moment) scents. I have to agree with the cheap packaging. My bottle of SlB doesn't spray a mist, but squirts, more like a water gun – it's like splashing it on. SlB is one of my 'comfort' scents, somehow the scent relaxes me – perhaps the lavender? THe amount of lavender I get varies from wearing to wearing. Longevity is not too great, unfortunately. I'd be curious about your opinion of Seve Exquise. Both SlB and SE start out very green and sappy, but after that they go in different directions. I find SlB drier, and SE more sappy and resinous. So glad to see another Sous Le Buis fan! Damp, green, mouldy is a perfect description. I loathed Biche too. Cumin, if I remember correctly? I should try it again though. I am still astonished at how frequently something I detest later turns into a favorite. Trying to decide about the packaging. It isn't ugly, exactly, but it isn't ornate or beautiful either. Just simple, and it makes no particular impression. Agree, don't like the spray mechanism, but that is true for many of my fragrances, and the GDs are not the worst. Also agree that the lavender varies. I usually hate lavender, but even when it seems prominent it does not bother me in SlB. 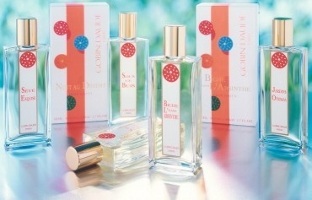 I was just wondering, is Sous le Buis anything at all like Diptyque Virgilio? When you said “dry gree” scent I immediately thought of Virgilio. No, not much like Virgilio. Virgilio is much woodier, and more herbal than SlB. Virgilio smells mostly like rosemary & basil to me. Have also seen it compared to a salad in a big cedar bowl, and that strikes me as apt. SlB is more of a generic green smell — there are some herbal undertones, but you don't smell it and think of a specific herb. You just think of green things & shrubs & trees. Hope that made some sense, I am having trouble describing the difference. I just stumbled on this website last week and loooove it! Your descriptions are so imagy…I nknow this blog is more than 2 years old but I need to know if someone could tell me where I could find a bottle of GD sous le buis? Hello Marie, and welcome! I'm sorry to say that Sous Le Buis is now virtually impossible to come by. I have not even seen bottles on eBay in a very long time. Takashimaya is a Japanese department store; they have a store in New York City. Thx so much for the fast response…that is pretty sad, such a nice perfume! I am so glad to have tumbled upon that site! I am the French women lost in Michigan!!! My new friends giving weird looks when whipping off a bottle of Miss Rocaille out of my bag, wandering how come I do not wear freaking Vera Wang!!! I almost gave in and join the knowledgless frenzy and buy Daisy from Marc Jacobs…cute but not me! Not that I know much about perfume, in the first place, but I know what I like and I surely dont like to smell like everybody else, and no urge to smell like a thirteen year old!! Since I joined your blog, I went totally insane and bought AG folavril, songes,chevrefeuille, eau du sud. AP chasse aux Papillons,eau des merveilles,JSLN, vent vert, bulgari the vert , Parfum de Nicolai vie de chateau, FM en passant et hiver,ordered the sample package from Ormonde Jayne and bunch of CB I hate perfume sample from the perfumed court ( on sale right now). And also free samples from AP site, just pay shipping! I think my upcoming divorce as finally made me jump head first in the insanity bin…hahaha just kidding! And wow, what a haul! You sound like me in my early perfumista days. You've bought some of my favorites, and I wish I owned Vie de Chateau.